Hi. I'm Deigh. I am a big fan of all things nostalgic. I have a blog. It is nostalgicdaydream.com Have a good yesterday. So I really like this antiperspirant. If you're like me, you sweat a lot. I mean, a ton. In Jr. High, my nickname was drippy. But most sticks really dry out my pits to the point of rashes and redness. Sometimes my pits itch so much I have to scratch them even during business meetings. That can get awkward fast. So far, this stuff seems to work. I hardly drip, it smells nice, and no red rash. I am pretty happy with everything. Ummmm. I know that technically candy corn is a mallow-based confectionery, but. . . candy corn marshmallows are kinda strange. I mean, the flavor's there, but the wax that makes the corn work is missing and the darn things are a bit overpowering in the sweet department. I fed one to my dog, but he barfed. I think he agreed they were too sweet. Gobstoppers. That word usually first brings to mind a weird, jack-shaped jagged candy that you can put in your mouth (due to influenster's crack editing team, I can not use a word that starts with s and ends with k and has four letters) and it'll never get any smaller. Invented for children with very little pocket money, Mr. Willy Wonka gave five prototypes out. All but four were given to the despicable Mr. Slugworth. SMH. That guy was evil. Of course, when the commercial version came out, there must have been an issue with the Gobsobinator (term patented by me). The treats that are in this box are round and glossy - not a semblance of jagged to be found. Not only that, I dissolved one in my own saliva, in like fifteen minutes, and it had a sweetart in the middle of it. So much for everlasting... Anyway, the flavor is good. Each color has a different taste. There were grape and cherry and orange and lemon and watermelon, but sadly no snozzberry. 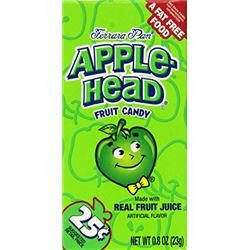 Appleheads are amazing candy. They have a crunchy center but soft outside, similar to a redhot in texture. The taste is pure apple, though. These come in the original small variety (about the size of a pearl) but also have jawbreaker sized candies and even chewy varieties that are similar to sour balls in texture. I remember when I was young - not like baby young, nobody remembers that - but much younger than I am today. My dad would always say I cried too much in church, so my mammy would shove one of these in my piehole. Man they were good! MY favorite flavors were grape and cherry, but I think everyone likes those the best. I would instantly stop crying until I got to the stick. The thing was, these babies were so delicious that I would just keep going. The stick would get all soggy and start to unravel. Sometimes, the stick would get so soggy that the half-melted pop would break off in my mouth and then I'd eat it like a jaw breaker. Come to think of it, It's a wonder I didn't choke. Anyway, every time I eat one of these, I think of Sunday School and salvation. Basically, this is a huge hole in the ground that has colors and stuff. One time, my family went camping there. On the way we got stuck in this ghost town and this crazy guy locked us in a jail cell because he thought we were after his gold claim. We weren't, and we finally escaped. Then we got to the canyon and took the mules to the bottom where we were going to camp. My sister Cindy and my brother Bobby got lost. We were all scared that a wolf or a cougar got them, but instead, an Indian boy rescued them. Then we had a powwow. Good times. Oreos are amazing. Orange Oreos that tie into Halloween are incredible. Oh, my zija, I am in love with these little confectionery babies. For some reason, the holidays seem a little brighter when you dye cream the colors that are traditionally associated with said holidays. Not only that, but Oreo raises the bar by also putting out crazy fall flavors like Caramel Apple and Pumpkin Spice. Are you kidding me?!?! Keep 'em coming and I'll keep buying them. In the fall of 1993, I went to Texas to visit my girlfriend. When I arrived, it was a Friday and Charlene was busy until around 9:00 pm, so what was I supposed to do? I went to the movies and saw this little gem. I instantly fell in love with the wacky characters and the amazing animation. The set pieces were like encapsulations of my dreams. I liked the movie so much that when her parents walked in on Charlene and I making out on the couch, I reached for a newspaper and pretended to read the movie review of this exact film. When her dad glared at me, I didn't even realize the paper was upside down. The next morning, I went to pick her up from church and her mom had sent her out with the paper. It had a sticky note on it that read: I thought that since you were so interested in this paper, I'd just give it to you. Yeah, so anyway, good movie. What? Halloween has its own beverage? To be honest, this stuff could taste like polar bear whiz (see my review for Polar Diet Orange Dry for more on this concept) and I would be fine with it because this was launched as a Halloween soda! Now I know, many of you found it in July or November, but the original campaign was Halloween in nature. And it was awesome! I highly encourage any Halloween food tie-ins.